Home News TJC holds a speical Municipal Court information session. TJC holds a speical Municipal Court information session. 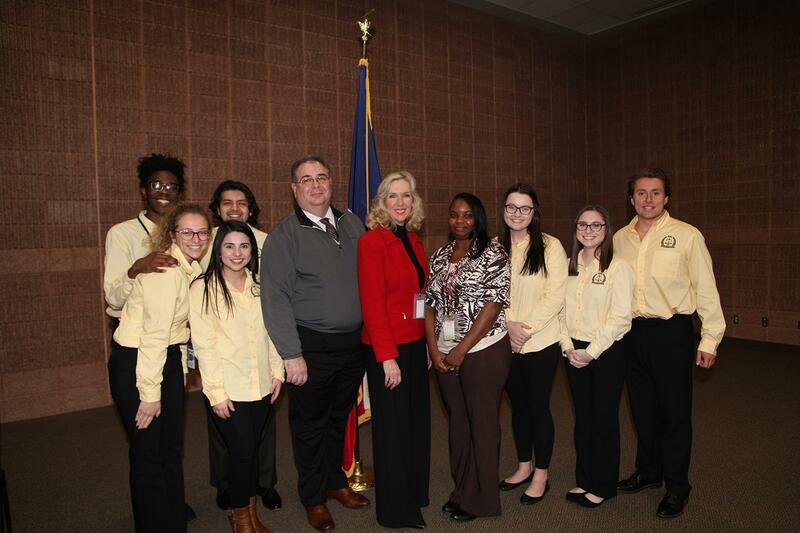 On March 5th the Tyler Junior College Student Senate hosted an event for students to learn legal advice on some of the issues that college students find concerning. TJC alumni Judge Amy McCullough was the speaker for the event. McCullough is a Tyler native who graduated from TJC in 1981. McCullough has served as a prosecutor in the district attorney’s office in Houston and as city attorney for the City of Pearland. She was appointed to the Tyler Municipal Court in 2017. Every year the City of Tyler Municipal Court hears a significant number of cases from high school and college students. This urged court to start an outreach program to educate high school and college students on making good choices. They also highlight the consequences of making bad choices. McCullough went on the explain that if a student misses their court date, they need to contact the court immediately. “We are a safe harbor. What that means is if you voluntary come to the court saying, ‘I have screwed up and I forgot my court date’, we will not arrest you.” McCullough said. McCullough and Alternate Judge Jim Huggler agreed that they will work with people who put forth a good faith effort to take care of their fines and issues, including substituting community service hours to work off their judgment. “If you show us along the way that you are making a good faith effort, we will work with you all along the process,” McCullough said. There are several convictions that people can receive. One of the most notable is traffic conviction such as a speeding ticket. According to McCullough, the department of public safely, also known as DPS, can assess points for each traffic conviction a person receives. “DPS has a surcharge program and they are going to assign points to all of the convictions that go on your record. A speeding ticket is worth 2 points[and] an accident is worth 3 points. When you get to 6 points in a three-year period, you will be notified by DPS and they will send you a bill every month and you are going to pay those surcharges, or they will suspend or revoke your license” McCullough said. Getting convicted of a crime can not only cost you money but you can also run the risk of damaging other important aspects of a student’s life such as Pell grants, scholarships, on-campus housing and your credit score to name a few. It is best for students to be as careful and try their hardest to not to get in any sort of trouble. The consequences of having convictions on your record can damage your life for a long time if not forever. The biggest lesson to take away from Judge McCullough’s presentation is that your actions have consequences and we should all think before we act.